I’ve mentioned a couple of times that German cheesecakes are different from Northern American cheesecakes. Traditionally we use quark instead of cream cheese. Quark (or topfen in Austria) is a kind of soft cheese that is made from sour milk. It’s an early stage of regular cheese. Quark is similar to cream cheese somehow, but its texture is a bit more grainy. It also tastes differently. It is a bit blander and more sour than cream cheese. It comes in different varieties with different fat levels. Vegan versions of quark do exist, although they do not really taste like the original version. Most also have a different texture. A popular yoghurt and soy milk brand seems to make their quark by reducing the amount of liquid in their yoghurt, to obtain a firmer texture. That is something what German vegans have been doing for years and this method is also the one I am showing you today. There are several methods to strain your yoghurt and over time I have tried a few. At first I used a coffee dripper and a filter. I placed the dripper over a bowl and poured the yoghurt inside. Then I let it drain in the fridge over night. I never really liked that method because I didn’t have much influence on the straining and the yogurt was difficult to scrape out. Then I used a cheesecloth but whenever I tried to squeeze that, huge blobs of yoghurt would squirt out. Then I read about nut bags. Umfortunately they are so insanely expensive that I never bothered buying them. (12 € for a scrap of polyester? Come on!) And I am glad about that now. I found a super cheap alternative and maybe you have access to that, too. (Or a nut bag.) At German drugstores you can buy laundry bags made from polyester. (I bought mine at a chain called dm.) They are very similar to a nut bag but cost only a fraction. And these are the bags I use for making quark. I usually pour the yoghurt into the bag and hook it up. (The laundry bag has a long, adjustable string.) It let it hang like that for three to four hours and drain the liquid that has collected at the bottom of the mixing bowl. After that I place a kitchen towel at the bottom of the bowl and place the yoghurt filled laundry bag on top of the towel. Then I let the yoghurt rest in the fridge for a night. The next morning the yoghurt has usually lost half its weight and is thick and creamy. If you don’t have access to nut or laundry bags, you can still make quark. 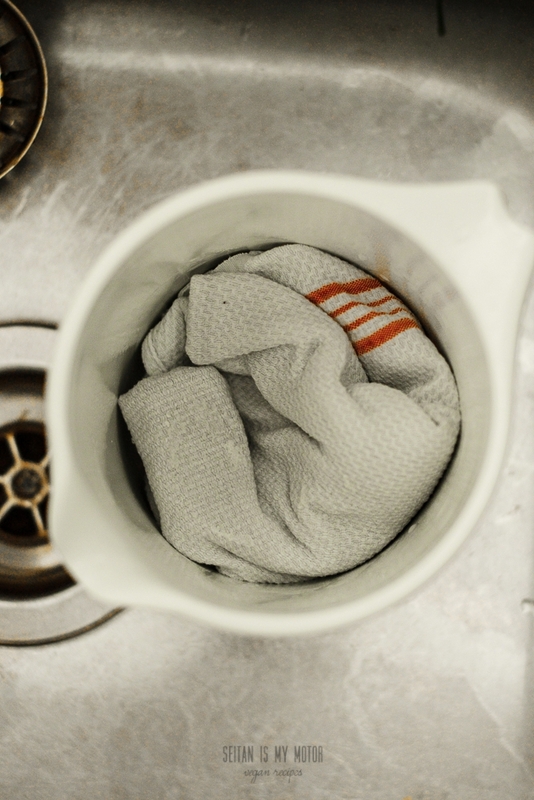 Pour your yoghurt into a double layered cheesecloth or a regular kitchen towel. Tie it up with a small piece of thread and hook it up. 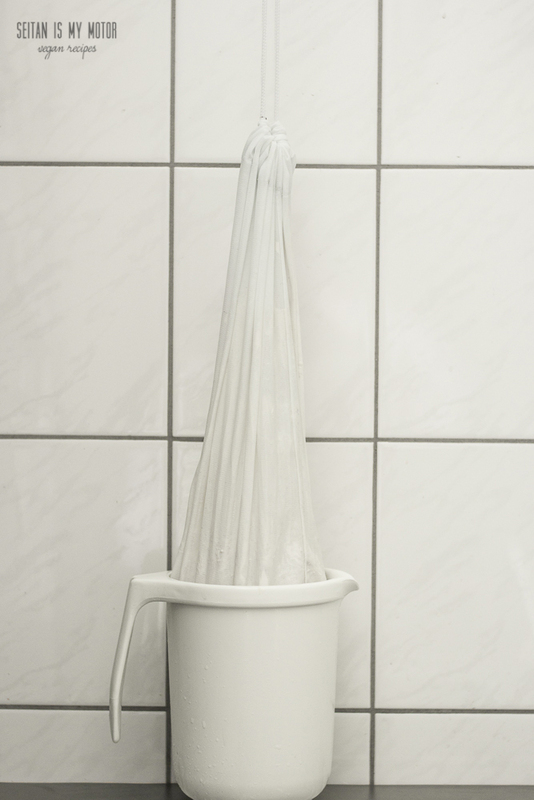 If you haven’t got any hooks, you can try to tie it around the tap on your kitchen sink. Sometimes that works. Or you leave out that step and start by placing the filled kitchen towel in your bowl. Over night it should be able to soak up a lot of liquid even if you didn’t drain the yoghurt before. Oh, one last thing: This time I didn’t use regular agar agar. 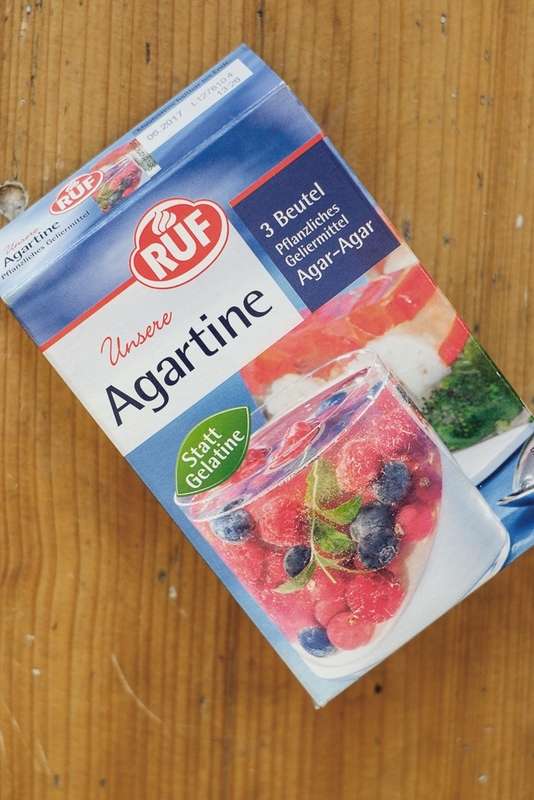 We have a product called Agartine, that is meant to replace gelatine in baking. The difference to regular agar is that Agartine is thinned with maltodextrin. One package measures 10 grams, of which 20 % are agar. So if you want to replace the Agartine with regular powdered agar agar, use 1 teaspoon (2 g). 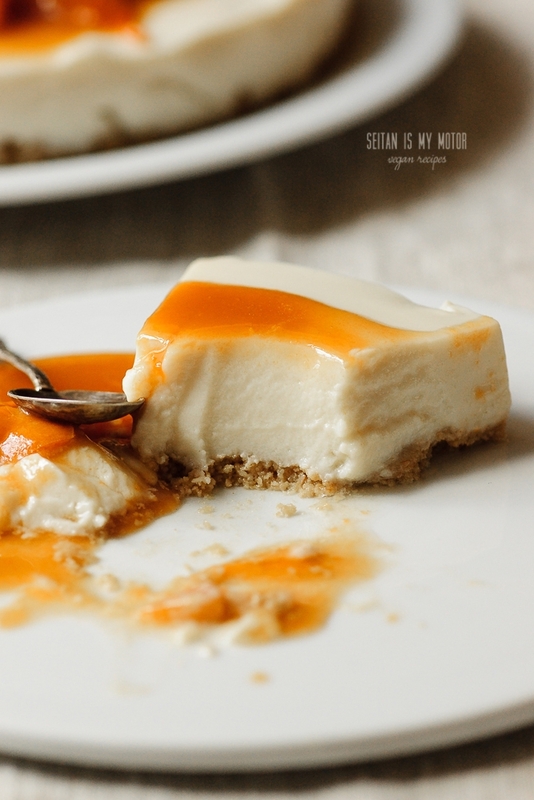 As I already said, this cheesecake has a very light and creamy texture.It tastes mild and fresh and is only lightly sweetened. That makes a great base for the caramelised apricots which go on top. The crust couldn’t be easier: A simple two incredient cookie crust that is stored in the fridge so it will hold together well. I think this recipe is a great alternative both for those who don’t have access to cream cheese (or don’t like it’s taste) and for those who have to avoid nuts (or cannot afford them in the quantitiy that is usually necessary for no-bake vegan cheesecakes). 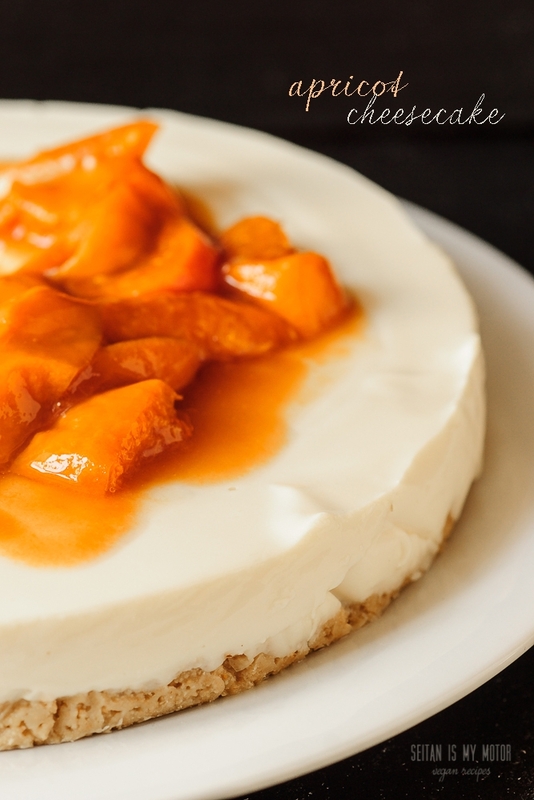 So this apricot cheesecake is easy to make, and except for the agar agar, it doesn’t require any fancy or expensive ingredients. A day before you plan to make your cheesecake, drain the yoghurt as explained above. Yield: 500 g of quark. The next day, line a 21 cm springform pan with parchment paper (bottom and sides). Place the cookies in a food processor and process into fine crumbs. Alternatively place the cookies in a freezer bag and use a rolling pin to crush the cookies. Mix with 4 tablespoons melted coconut oil. Press into the prepared pan and place in the fridge. Pour the quark into a large bowl and mix with remaining coconut oil and sugar. Place 200 ml quince juice and agartine (or apple juice and agar agar) in a small saucepan and bring to a boil. Boil for two minutes and let cool for five minutes. Mix with the quark mixture until everything is smooth. Remove the pan from the fridge and pour the quark mixture over the cookie crust. Refridgerate for 2 hours, then place the cake in the freezer for 30 minutes. 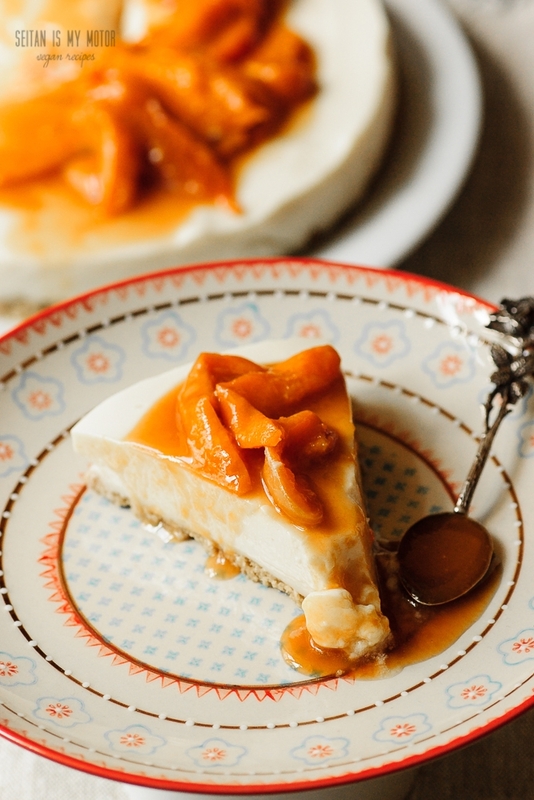 While it's in the fridge, prepare the caramelised apricots. Bring to a boil and cook until the sugar has melted, stirring constantly. Mix remaining juice with cornstarch and stir well until there are no lumps left. Pour over the apricots and cook for another two minutes, stirring. Carefully remove the cake from its pan. Place the apricots on top of the cake. Reserve some of the apricot caramel for serving. Store in the fridge until you are ready to serve it. This cake's leftovers are best stored in the fridge, too. Juhu, das Rezept perfekt in diese Hitzewelle. Da ist es mir nämlich viel zu heiss zum Kochen (oder Backen), aber das benötigt dieser Kuchen ja gar nicht, perfekt! Das Rezept speicher ich mir direkt ab, danke!=) Sieht super lecker aus! Yes, you can buy quince juice commercially. I have never made my own although I love baking with quinces. You had me at apricots. I’m going to make a batch of soy yogurt if my culture is still alive, and whip this up ASAP. I’m also sending the link to my Mutti because we share the same passion for apricots. Thanks C! Awesome that you are still making your own soy yoghurt. I shoud start a batch, too. I really wish I didn’t have to, I’m still lazy otherwise. It’s just that I can’t find plain soy yogurt here. Maybe I can replace the soy yogurt with unicorn tears, would that work? I am going to try this with some of the next batch of Kefir. I will replace the sugar with stevia or birch sweetener. This should be perfect with the Kefir since the “cheese” is not cooked – allowing my raw milk Kefir to live up to its full potential. YES! I’m in the States and we obviously can’t get vegan Quark here. Thank you!!!! ehm, you shouldn’t write without nuts ’cause it still contains coconut oil. At least the person I wanted to make this cake for cannot eat it because of nut allergy. She’s also allergic to coconut oil. Any chance to replace it with something else? I guess you use coconut oil because of the outstanding hardening aspect of cold coco oil. And I cannot think of a substitute for that. Any advice is welcome (or in general replacements for coconut oil). Hi Jürgen, Coconut is not a nut. (Just like panuts aren’t nuts – they are legumes.) It’s a member of the palm family and not related to tree nuts or peanuts. Which doesn’t mean that people aren’t allergic to it, of course. And I am clearly not an expert on allergies. If you read the English version of this blog entry, you will find a suggestion for a substitute in the text. I suggest to use margarine. You are correct in assuming it won’t harden that much. But it should do for the crust. The filling might need some experimenting and probably a bit more agar agar. I haven’t tried that, obviously. My kind of cake! Quark is so versatile! Until I was in my teens I didn’t know one could buy Quark, we always made it ourselves. Favorite was Luckeleskäse (for my father). I will try this recipe with drained Schichtkäse and fresh apricots. Thank you for the recipe.